It was probably something I should've checked when I took the car on, but in the end I came across it just in time. While checking the rear diff. was topped up I noticed the exhaust's rear saddle brackets had totally rusted through and the exhaust was being supported by about a centimetre of rusty metal. 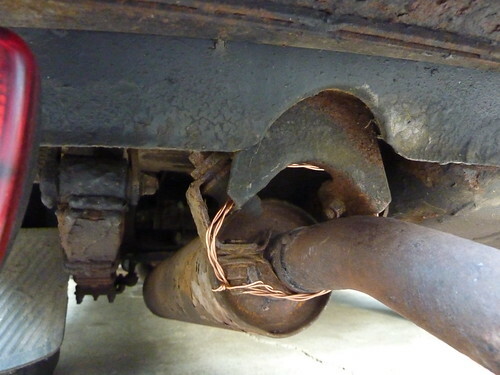 We wrapped the exhaust with wire as a temporary measure until the new parts arrived. Now if only the exhaust pipe was as shiny as the bracket!